Eagle Rock Entertainment announced this past week that on Mar. 12 the magical 1986 concert at Wembley by the rock group Queen will be re-released as a double-disc DVD SKU titled Queen: Live at Wembley Stadium – 25th Anniversary Edition. There were two sold-out concerts (Friday, July 11th and Saturday, July 12th) … for the first time Eagle Rock has re-mastered both performances — a massive 26-song set on Friday, with two additional numbers on Saturday. 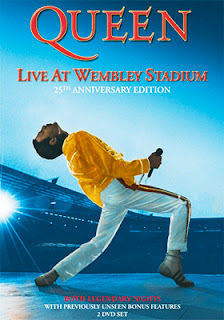 In addition to the concerts, there all sorts of bonus goodies, including secret footage of the group in rehearsal, newly prepared interviews with Roger Taylor and Brian May, plus a 2003 film featuring the same two original Queen band members. “There, but by the grace of God, go I,” is a familiar prayer … often uttered as the windows are rolled up and the doors locked as one encounters a group of homeless. It is easy to forget that they are people, with names and faces, who once had hopes, families and dreams. In documentary filmmaker Thomas Napper’s Lost Angels: Skid Row Is My Home, due out on DVD from Cinema Libre on Mar. 19, eight of the homeless who reside on the streets of Los Angeles have their names and stories put with those faces of despair. Narration is by Catherine Keener. Within this structure of introducing us to the broken (almost always by drugs or mental illness … or both) Napper weaves in a history of the long-standing area just to the east of downtown Los Angeles between 3rd and 7th and bounded by Main on the west and Alameda to the east. The film can serve as a call to action or as a reminder that these too are people. Or simply as a history of what is past is future … economic pressures and social failings seem to create an endless stream of new Skid Row citizens regardless of today or 80 years ago. 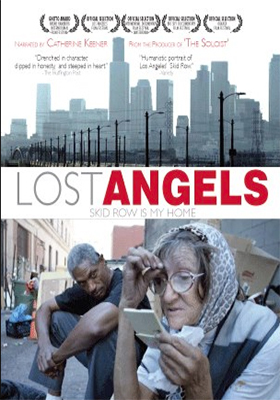 No matter what you take away from viewing Lost Angels: Skid Row Is My Home it does get you to thinking … and that’s a good first step.